Home > Blog > Blog > Hey Apple, What About iPad’s Accessibility? In Apple’s rush to debut the new iPad tablet it forgot one little piece of marketing: Accessibility. Apple has an accessibility page but it didn’t bother to add the iPad before launching it yesterday at its headquarters. And even though Steve Jobs’ keynote was likely prepared, Apple didn’t bother to add captions for deaf or hard of hearing reporters, nor did it add captions to the 46-minute video broadcast of Jobs’ speech or the video “demo” of the new tablet. - VoiceOver. This is the screen reader made popular on the Mac thats speaks menus, texts and objects aloud for people who are blind or visually impaired. But not all of VoiceOver’s 21 languages will be available. - Screen zoom. This will make the page or text larger. Contrast can also be changed to a white-on-black display for easier reading. - Closed-captioned support. All content “that is captioned” will be supported on the iPad. A big BUT. This doesn’t mean that TV shows are available in captions; in fact, there are zero captioned TV shows in iTunes. You can search for captioned movies and iTunes U content by doing a Power Search in the iTunes store and selecting the “Search only for movies that contain Closed Captioning” box. There are about 200 captioned movies available. Alternatively, surf over to Hulu.com on your iPad and watch TV shows, like Fox’s Glee, with captions. That Artie is a hoot! The design features are also impressive and will help certain groups of people with disabilities. 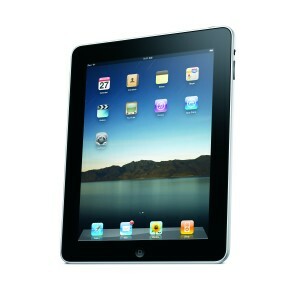 For one, the size is bigger (9.7 inches, vs. the iPod’s 4.7 inches), and is very light, weighing one-and-a-half pounds. People with motor disabilities who cannot physically flip pages of a book or control a computer mouse to surf the web can rest the tablet on their lap and potentially use their fingers or elbow to control the tablet. Apple also announced the new iBooks app for iPad, which will “feature books from major and independent publishers.” With VoiceOver, books could potentially be read aloud, which is great for those with vision impairments, but this issue is still largely dependent on whether publishers will allow audio support on e-readers, which many publishers say is a copyright infringement. For those who use the iPod as a daily assistive device, the size helps make many apps easier to use, like Proloquo2go, a text-to-speech app for those who speak by touching words, images and phrases on the screen. With the iPod or iTouch, external speakers were necessary; the iPad has built-in speakers making it easier for them to communicate out loud. Another app, iPrompts, is a picture scheduler for those with developmental disabilities. For this group and others (perhaps those who have had a stroke or traumatic brain injury), ease-of-use will provide them with more confidence for buying and using this device. And fortunately, those who cannot use the on-screen keyboard (such as people with motor or vision impairments) can plug in an external keyboard. Still, Apple needs to find ways to allow alternative (ergonomic, perhaps) keyboards and input devices — like switches — to be used with the iPad to make it fully accessible. What does interest me is that the device does one thing particularly well; it succeeds in developing accessibility and usability beyond that of many other such devices we’ve seen. As observed by many parents, the fact that a child can pick up the iPad or similar touch screen devices and interact with the graphical user interface instinctively instinct or based on intuition is a very valuable asset and should be central to the debate surrounding the worth of the iPad to the consumer market. The beauty of touch screen devices is that they rely on and promote our most basic human instincts. As children develop they rely on the tangible and on experimentation with objects to determine what they are and how they can be used, if at all. Perhaps consider disabled users, the ability to simply lightly touch the screen to interact with the device, as opposed to requiring the dextrous use of the mouse or keyboard could revolutionise some people’s ability to access information, products or services online. And after all, many would argue that access to the internet and information on a broader scale should be considered a basic human right. I sort of agree with Simon when he states that the access to the internet is a basic human right, at least in this day of age. I have asked Steve Jobs if it was possible to have a mouse input on an iPad for disabled persons. Now it appears that even the home botton may be replaced with a multiple finge gesture. This is great if you are loosing control of your hands and voice. The iPad is great for me, an iPod, book reader, radio receiver for interent radio etc, but only whilst I can operate it. It seems to me that accessibility isn’t stressed enough and is often overlooked; which is pretty unfortunate.